Cosmic Conflict also makes the Cosmos even bigger, adding another player (and attractive black components) to the game. Cosmic Quakes will shake things up, ensuring that no playerâ€™s hand is truly safe. And as if that wasnâ€™t enough, Cosmic Conflict introduces a new variant to the game â€“ the hazard deck, which confronts the players with dangerous and amusing events that can crop up at any time! Other products in the "Cosmic Encounter" series. 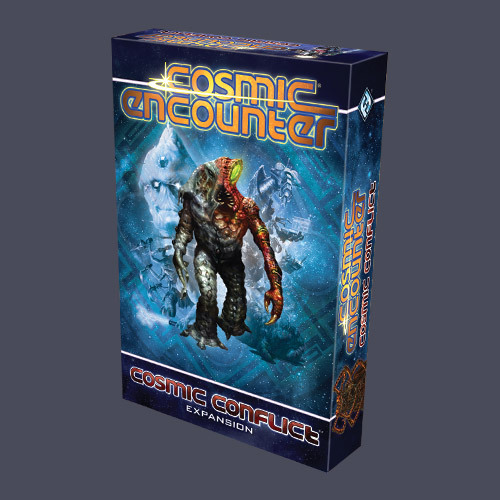 This game provides all the additional expansion to Cosmic Encounter you might ever want! I'm not sure every group will want to add all the decks together each time they play, but one truly indispensable element in this expansion is the assembly of new races! Some of them are very fun and disruptive, and we've all enjoyed these surprises greatly! It's simple - If you like Cosmic Encounter, you want as many new races and modular expansions as possible. Therefore, if you like CE, you must get this as soon as you can!